Enter the archfiend Doc Ock, armed with a lethal invention powerful enough to destroy half the city. If Spider-Man doesn't stop Doc Ock, it could be the end of the Big Apple. With millions of lives hanging in the balance, high above Manhattan's glittering skyline Spider-Man confronts his destiny, his fiercest enemy, and himself. 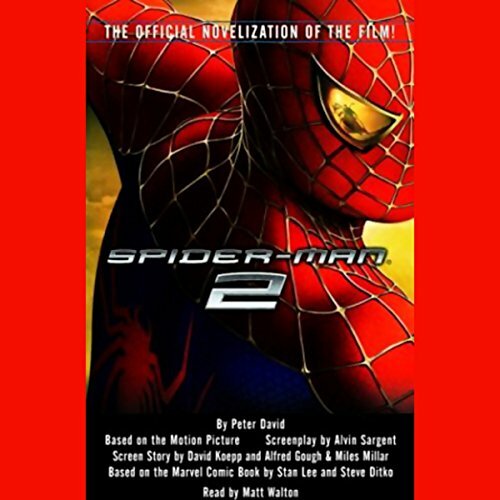 ©2004 Columbia Pictures Industries, Inc. (P)2004 Random House, Inc. Random House Audio, a division of Random House, Inc.
Where does Spider-Man 2 rank among all the audiobooks you’ve listened to so far? I downloaded this for my son, who is seven, and an avid Spider-Man fan. He sat and listened to the whole thing, playing along with his action figures. He really enjoyed it. I liked that my son would sit and listen and see it and talk about it later. He will listen to it again and again. Good book. Just too many "bad" words in it.